Clever PR, quiescent journalists and researchers who are cashing in on their patents and selling a product have rehashed an old story that genetically engineered purple tomatoes are a healthy “superfood”. But the claims are questionable and the risks haven’t been assessed. If you believe the recent reports in the newspapers, UK researchers have developed a genetically engineered tomato which can provide all manner of health benefits – including “keeping cancer at bay”. But, they say, irrational anti-GM campaigners and overly restrictive EU regulations have prevented it being produced in the UK and the researchers have had to take this wonder to be grown and processed in Canada. Now – in the form of two thousand litres of juice – it’s about to return to the UK to confirm it is wondrously healthy by being drunk by human volunteers. 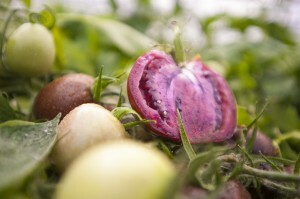 The GM tomatoes are rich in anthocyanins, an antioxidant, that gives the “purple tomato” its colour. Although there is evidence that anthocyanin-rich foods have health promoting benefits, this evidence is also disputed by some. [The issue of antioxidants health benefits is complex. 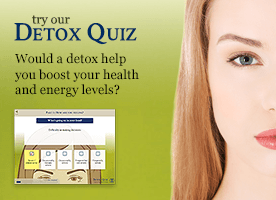 Antioxidant supplements may have a very different effect from a diet rich in antioxidant rich- foods; nor can supplements on their own can’t make up for a multitude of other risks to health such as a polluted environment and poor lifestyles – NYR Natural News Ed]. The evidence that this tomato is a “super food” which can “keep cancer at bay” is limited – in fact it is based on one study where 20 mice were given the purple tomato as part of their diet. That group lived 40 days longer than the controls, which is interesting, but as a basis for all the hype and starting human trials it is flimsy and concerning. And there are some questions. The genetic engineering that produced this tomato involved the incorporation of an antibiotic resistance gene into the plant cells. It is present in every cell of the plant, in the harvested tomatoes and in the juice. This is not something consumers expect to find in a “health food” and, of course, the researchers avoid mentioning it. The health impact of these antibiotic resistance genes is a matter of speculation but effects on the human gut bacteria and the potential of contributing to the build up of human and animal resistance to antibiotics have been mooted. That’s why the EU has a policy discouraging the use of antibiotic resistance genes in genetic engineering – another thing the researchers don’t mention. They probably feel this is an example of the EU’s overly restrictive approach to GM regulation which caused them to contract out the growing of their tomatoes to a company in Canada. Canada, they say, is much more rational and sympathetic than the EU when regulating genetic engineering. The basis for Canadian (and US) assessments of GM crops is a spurious notion known as “substantial equivalence”. Which means that if a GM crop can be said to be “substantially equivalent” to its non-GM counterpart it does not have to undergo any additional risk or safety evaluation. This might seem to be a reasonable starting point if more than a few basic components were considered but they rarely are; and consequently few genetically engineered crops are required to undergo compulsory safety testing. Under this approach a cow affected by BSE would be accepted as “substantially equivalent” to a cow without BSE. But it’s clear that this genetically engineered purple tomato is not even slightly equivalent to a conventionally bred one. First of all the researchers have been granted a patent on it – which must mean that something new, novel and innovative has taken place which is substantially different from anything occurring in a non-genetically engineered purple tomato. Secondly, genes from another plant (the snapdragon) have been engineered into the tomato causing a significant increase in anthocyanin levels and a change in colour throughout the whole tomato fruit. This is also substantially different and therefore it not only seems sensible – and regulations in both the EU and Canada require – that robust safety assessments are undertaken before tests involving humans begin. But to date no safety assessments have been carried out – or if they have, they have not been reported – and none seem to be in the offing. Not in the EU and not in Canada where the tomatoes have been grown and will be juiced. Neither Health Canada nor the Canadian Food Inspection Agency (CFIA) have assessed or approved the GM purple tomato. CFIA issued a permit for a batch to be grown in a contained greenhouse on the basis that they will not be entering the Canadian food chain but were being returned to the UK. In doing so, some commentators have argued, CFIA seem to have broken their own rules. Prof Cathie Martin from the UK’s John Innes Centre, the project’s lead researcher thinks this is “truly fantastic”. She told journalists, “I can’t stress enough how enlightened the Canadian regulatory process towards these types of [genetically modified] foods is”. In fact, her purple tomatoes could easily have been “bulked up” for research purposes in a contained greenhouse in the UK without much expense and with a minimum regulatory oversight from UK authorities. But the UK press hasn’t bothered to question her on this. The narrative of a UK GM researcher having to sidestep onerous UK and EU regulations is far too compelling. Whether a UK taxpayer funded researcher from a UK taxpayer funded research institution should be sidestepping UK and EU regulations is an issue yet to be adequately addressed. Meanwhile Prof Martin seems to be developing a taste for it. According to a Canadian National Post article which reported an interview with her, the purple tomato juice “when shipped to the UK bypasses GM/environmental regulations because a seedless product can’t reproduce itself”. Quixotically bypassing some presumed environmental regulatory burden is one thing, but proposing to sidestep food safety and toxicological evaluation with at risk people is something that even the quirky Prof Martin wouldn’t do. Or would she? She is certainly giving the media the impression that it’s next on the agenda. Prof Martin does seem to enjoy impressing the media. As mentioned above, the purple tomato story is not a new one but she has frequently milked it. One of her earliest efforts takes some beating though. Her Daily Mail article of 8th November 2008 was headed, “How my purple tomato could save your life” . Since then Martin, her colleagues at the John Innes Centre and the Centre itself have continued to produce rehashed versions of the same story – and the media have bought it again and again; including the “Science Correspondents” on the BBC and the so called “quality” press. Disturbingly – to anyone who believes we need an intelligent and questioning media – they have rarely, if ever, qualified the claims of Prof Martin and her John Innes colleagues with the views of medical and nutritional experts. These views are on record, cogently and forcefully refuting Martin’s claims. Following her Daily Mail splash in 2008, Cancer Research UK issued a statement headed “Purple tomatoes won’t beat cancer”. In the same year the NHS Knowledge Service pointed to the very limited nature of Prof Martin’s research and said it was not sufficient to justify the health claims being made for purple tomatoes. In their view, partially feeding purple tomatoes to 20 mice was inadequate and more research was needed. Since then – zilch – no research on purple tomatoes by Prof Martin or the John Innes Centre; only press releases and media interviews. Nothing on toxicology, nothing on risk, nothing on health claims. Is it appropriate that the John Innes Centre – a UK government funded research institute –consistently gives its backing to the PR claims made for the GM purple tomato? Norfolk Plant Sciences (NPS) also backs the health claims made for the purple tomato – but NPS is a private company which aims to commercialise it. NPS was founded and is co-owned by Prof Cathie Martin and her John Innes Centre based colleague Prof Jonathan Jones. This is the same Prof Jones who the media regularly quote as an independent, impartial scientific expert on genetic engineering. Prof Jones extolled the virtues of the GM purple tomato and the iniquity of the EU GM regulatory system to the press during this latest PR push, without revealing – or being asked about – his commercial interests. Martin and Jones are taxpayer funded researchers based at a taxpayer funded institution; yet they are able to seek to cash in on taxpayer funded work and intellectual property (patents) they acquired whilst being paid by taxpayers. The genetically engineered purple tomato might not be up to much but a system that allows public funding to be used for private gain like this – a system that underpins much GM research – needs examination. The GM purple tomato isn’t it. Even if anthocyanin has health benefits, do we need a genetically engineered tomato? There are plenty of fruit and vegetables rich in anthocyanins – blackberries, blueberries, aubergines, red cabbage, red onions and many more – including traditional and non-GM tomato varieties. [There are also naturally occurring heritage varieties of purple tomatoes which are rich in anthocyanins – NYR Natural News Ed]. The genetically engineered purple tomato is a classic case of a GM “solution” looking for a problem and GM researchers looking for something useful to do. But did they have to spend £900,000 of taxpayer money doing it? As they are paid by us – the taxpayers – they shouldn’t be allowed to peddle myths to justify it. This story first appeared on the Citizens Concerned about GM website, under the title Who Says GM Purple Tomatoes are a Healthy Option?. We are grateful for their permission to reproduce an edited version on our site with additional comments and links/references. Increased seizure risk in autistic children – is there a GMO link?